Want to add something extra to your kitchen but don’t know where to start? Try an eye-catching island bench. When space allows, an island bench is almost always included in a kitchen renovation – and for good reason. As well as extra storage and bench space, an island turns a kitchen from a functional work space into a place to gather for food, conversation and more – islands often double as homework or work stations, or as a spot to spread out the paper over a morning coffee. Now that islands are de rigueur, designs that sidestep the norm were bound to appear. As these impressive kitchen islands reveal, a standout kitchen island can set the tone not just for the kitchen, but the entire open-plan zone in which it sits. Whether sleek and contemporary, or rustic and tactile, these island benches will have you thinking outside the rectangular box. A hand-cut granite island bench in a kitchen designed by Alexandra Kidd Design steals the show in this ultra-modern harbourside home in Sydney. Bold design moves like this contribute to the home’s sophisticated aesthetic, and add interest to its somewhat masculine concrete structure. The island’s raw finish interrupts the sleek surfaces so prominent in the rest of the home. Texture rather than colour is used to add warmth and personality. Granite takes on a dramatically different look in this glamorous kitchen. Serving as a striking centrepiece, the ‘Verde Bamboo’ granite island is an elegant companion for vinyl-wrapped doors and glass shelves offset with a mirrored splashback. The island has more than just good looks. Deep drawers on both sides create a storage bonanza. The owners of this Woollahra, Sydney home wanted their new kitchen to have the feel of a Parisian apartment – old-world charm, but with a modern twist. 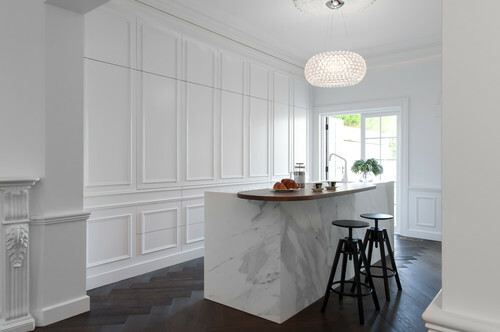 The Calacatta marble island takes the kitchen from traditional to high-end, its fine lines giving the impression the island is cut from a solid block of marble. Keeping the drawers to one side enhances the streamlined look, with a curvaceous stained-oak timber bar top providing an overhang for a pair of kitchen stools. When not in use, the panelled cabinetry can be closed up to hide the stove, ovens and fridge, allowing the island to truly shine. Who says islands need to be rectangular? Rounding off the ends takes an island into the realm of exceptional, and is sure to make guests look twice. Timber is used with abandon inside and outside this Geelong home, aptly named ‘The Ark’. Storage has been seamlessly hidden within the shapely island end. 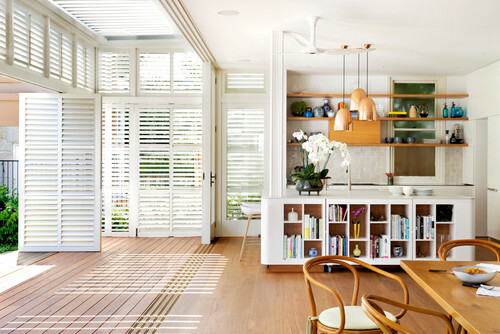 The kitchen in this Federation home’s extension on Sydney’s North Shore opens to the back garden. Instead of long and relatively narrow, as most islands are, this island is as deep as it is wide, creating the opportunity for storage on each of the four sides. Although there’s already room for a couple of stools, look closely under the island on this side and you’ll notice part of the open shelving is on wheels. This section was designed as a ‘cart’ that can be moved out to create a breakfast nook or reading spot. The island benchtop is thin-edged reconstituted stone by Stone Italiana. When the western sun pours in of an afternoon, the shutters can be closed up to keep the kitchen cool. With extra storage one of the outcomes desired by homeowners in a renovated kitchen, islands tend to be blocky to accommodate drawers on one or both sides. When your kitchen has ample storage built in elsewhere, however, the island can take on a different form. This island was designed to look like a piece of furniture, to sit off the floor and complement the extension’s airy feel. 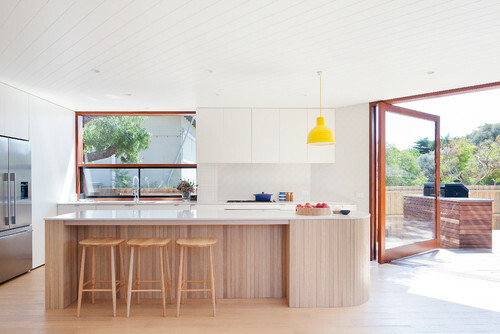 Hotplates were built into the island to encourage conversation during cooking, and raw and painted plywood ties in with the abundance of timber used in the rest of the space. The windows and exposed beams are Tasmanian oak and the floors are blackbutt. Homeowners are increasingly doing whatever it takes to get that coveted island even if, as in this case, it means suspending it over a set of stairs. Doing so has given these homeowners the extra bench space they wanted, without having to skimp on island dimensions. 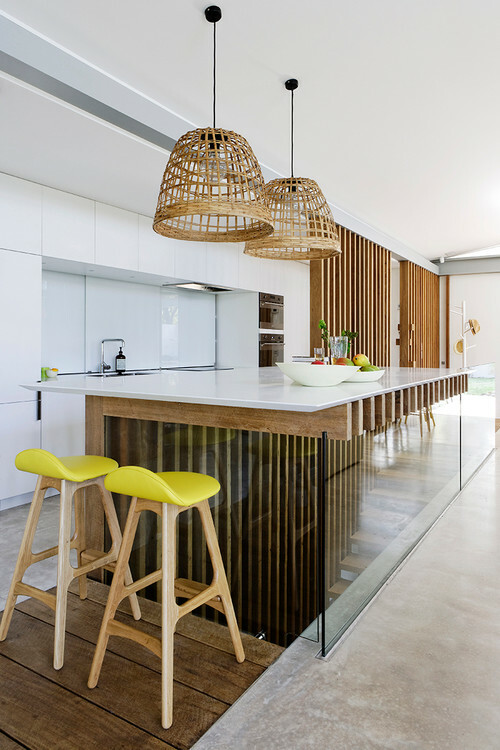 The vertical timber slats underneath the island mirror other timber feature walls inside and out of this beachside home near Sydney. You might recognise this lavish kitchen from an episode of The Block. Contestants Julia and Sasha went all out to impress the judges with a backlit Caesarstone Concetto ‘White Quartz‘ island. Mirrored kickboards beneath the glowing box were chosen to give the island the illusion of floating. 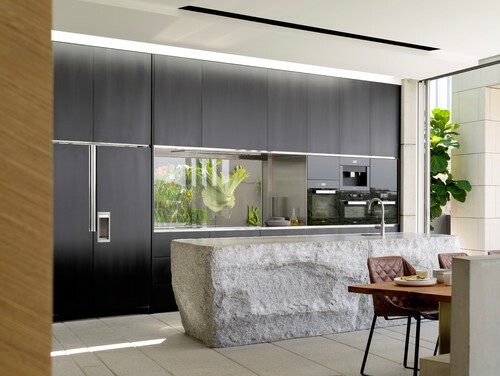 The island benchtop is Caesarstone ‘Vanilla Noir‘. Do you have a kitchen island that’s a little different? Share a photo in the comments below.